Trump said on Fox News’ “Fox and Friends” that he is not planning to sign the negotiated measure. …The rejection of the compromise contradicts messaging from the White House in recent days. Earlier this week, top White House adviser Stephen Miller, a known hardliner on immigration, was on the Hill telling key conservatives the White House was supportive of the negotiations on the bill, and House Speaker Paul Ryan told his GOP members behind closed doors that he had been in touch with Trump who was “excited” about the process. Why yes, yes he was! 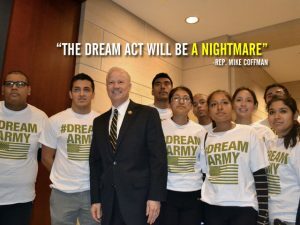 And as far as the attempt to pass comprehensive immigration reform under President Barack Obama back in 2013–as we recall, didn’t Mike Coffman have something to say about that too? And with that, our work is done here. There are Republicans in Congress today who have credibility when it comes to this long-vexing issue, and a consistent record of trying to find solutions so that doesn’t smack of contrivance and political desperation. Mike Coffman is not one of those Republicans. In every way that counts, he is part of the problem. I wonder if the discharge petition comes back next month? Now that it is clear Republicans are putting up bills guaranteed to fail rather than a position resembling what previously passed the Senate, I wonder if the moderates who hesitated will feel the need to try once again. A toddler screams while jack-booted ICE agents tear her away from her mother. Donald Trump cheers the agents on while Cory Gardner smiles and nods approvingly. Hispanic voting participation in Texas and Arizona go through the roof. While Beauregard Sessions quotes scripture to justify what they are doing. Mike Coffman is two steps ahead of you as usual. I did notice him tripping and falling flat on his face. He pretended that he was just going down for some quick push-ups. Did he get there by goose-stepping like a good Twitler follower? Looks more like Coffman is running around in circles trying to avoid getting run over by Trump's latest 180. I see the Walmart internment camp where the US is holding the snatched children is referred to by ICE as "Casa Padre". Casa Padre also has some fine propaganda art inside.